Attendance is free of charge to all. Just make sure you wear tennis shoes or non-marking trainers. Demonstration racquets will be available to trial and purchase, as will shoes, other tennis clothing and accessories. For the seniors there will be mixed social tennis. .
​There is an exciting and original event being planned by Wanaka Tennis Club. The event will take place on 26-28 October 2018 and will be of great interest to tennis enthusiasts and foodies alike. For only $175 pp you receive drinks on board the Lady Pembroke on Friday night, BBQ dinner on Saturday night, lunch on Sunday, plus a weekend of tennis matches at some of the most stunning private courts in the Wanaka area. Note that overnight accommodation in Wanaka is not included. See the poster for more details and direct any enquiries to Jeanette Hatten at Wanaka Tennis Club on 021 298 6229 or download an entry form. There will be a vacancy for the position of Secretary as James is taking a sabbatical and going overseas at the end of the Spring. QTC will also be looking for new committee members as new blood is vital to the ongoing success of the club. If you would like to know more about these positions, please contact James on 027 698 8333, or 03 442 7896 or via email. Otago finished in second place, Southland third and North Otago fourth. In Division 2 the Southern Lakes B team was narrowly pipped for the title by Otago B. It's worth mentioning that until a week or so before the start of the tournament, Ben didn't even know for sure that he would be able to make the main draw. He and Jan-Lennart had never played together before, and this was Ben's first Grand Slam event since his junior days. Ben now heads to Japan for the Davis Cup tie against Italy, in which he will play doubles. Queenstowner Ben McLachlan has won his first ATP doubles title on his debut at the Japan Open in Tokyo. Playing with Yasutaka Uchiyama, and given a wildcard due to his switch of nationality to Japan and representation at the Davis Cup, Ben seized the opportunity with both hands as he and Yasutaka swept through the draw. Not that it was easy though. In the quarter-final the guys beat the reigning US Open Champions, Jean-Julien Rojer & Horia Tecau 7-6 7-6. In the final our guys beat Jamie Murray & Bruno Soares 6-4 7-6. Between them, those four players have no less than 16 Grand Slam doubles titles. 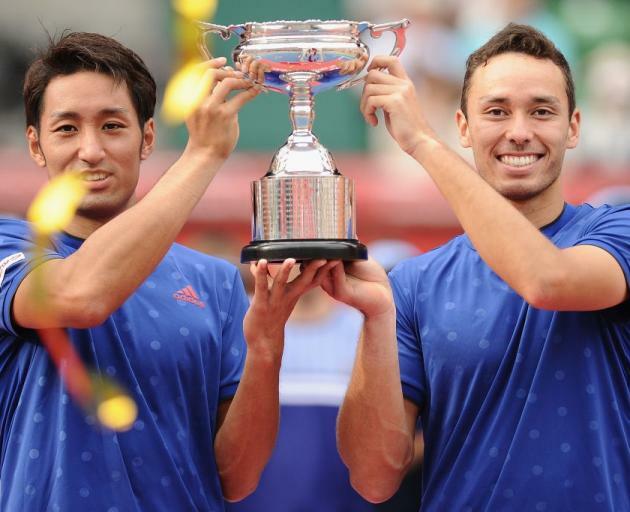 Ben and Yasutaka win US$50,000 each and 500 ranking points, which catapults Ben up to highest ever ranking of #80 and opens the door to many more ATP events, without the need for a wildcard entry. This week Ben heads to Antwerp, Belgium for the European Open, where he will partner Andres Molteni of Argentina, who is ranked #45 and has three ATP doubles titles to his name. The guy's win gathered a great deal of attention in the media. Here are links to some of the articles. The first of our Senior Opening Days was cancelled due to snow and rain, but that's OK. We still have two more to go. Attendance is free of charge to all. Just make sure you wear tennis shoes or non-marking trainers. Demonstration racquets will be available to trial and purchase, as will shoes, other tennis clothing and accessories. For the seniors there will be mixed social tennis. For the juniors, the coaches will set up some fun games. This isn't the weather we ordered for our Opening Day! The QTC Annual General Meeting was held on Wednesday 16th August. Attendees agreed unanimously to maintain subscriptions at the 16-17 rates, and set the Senior Opening Days for the 17-18 season for Saturdays 9, 16 & 23 September (from 1pm). The Junior Opening Day will be Sunday 24th September, also from 1pm. On Saturday 9th September there will be a working bee from 11am-1pm to tidy up the facilities prior to the first Opening Day. The South Island Masters Games will take place in Nelson from 4-8 October 2017. More than 40 sports are included in the Games. For the tennis, events will be held in men's and ladies' singles, men's and ladies' doubles and mixed doubles. Minimum age for qualification is 35 but events will be held in various age categories, including 35+, 45+, 55+, 65+ and maybe even older if the demand is there. Early bird registration closes on 1 July, but you still have until September to register. For more information, go to the event website or check out their Facebook page. Young Kai Milburn, eldest son of QTC coach Mark & Takako Milburn, recently finished runner-up in a major 10u tournament in Sendai, Japan. Subsequently, Kai has been selected to represent Japan in a national 10u squad, competing in a quad tournament in South Korea in August. The Japan team will play against South Korea, Thailand and Singapore. Well done the S Lakes team. We're all very proud of you. A big thank you as always to Karen and Mark for managing the team. The full match results can be found here. Thanks to La Residence du Parc for their generous sponsorship of this new category. Dan & Tania each win a 1 hour private lesson with Mark Milburn. Congratulations to all winners. Roll on the 17-18 season. 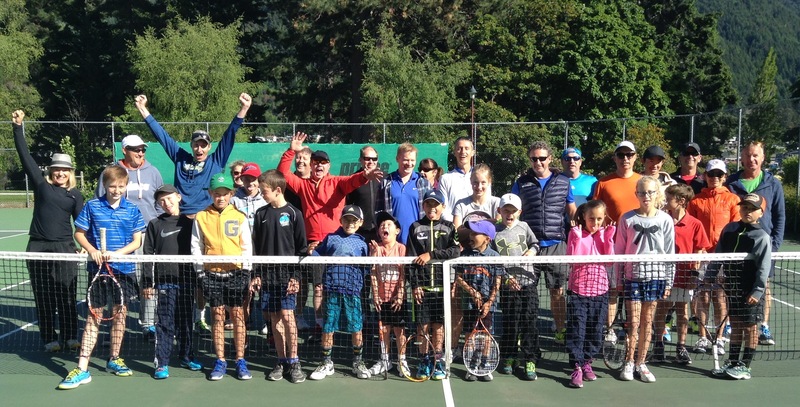 The first collaborative junior training day between the Southern Lakes Tennis Association and the Southland Tennis Association on Sunday 19 March has been a huge success. Top juniors aged 9+ from Southland and Southern Lakes were put through their paces by the coaching trio of Danny Baleson (Te Anau), Mark Milburn and Riki McLachlan. Click anywhere on the picture for all the photos from the day. likely to be the first of a series of joint training days between the associations and will undoubtedly see our juniors gain the skills necessary to compete at the highest level of junior competition in NZ, where they will represent the entire Southern Region. Thanks to Danny, Mark & Riki for setting the day up and coaching. Thanks to everyone who provided food and baking for the lunch, and especially to Takako, Michaela, Indra, Jo and Alister for doing kitchen and BBQ duties, and to everyone else who assisted in the running of the day. Thanks also to Queenstown Tennis Club for making the courts available. 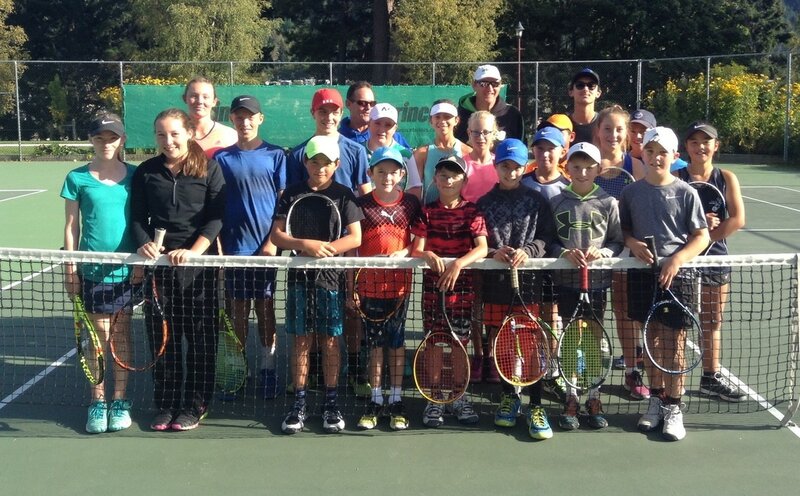 A large crowd was entertained by some brilliant tennis over the weekend of 11-12 February as the Lone Star Queenstown attracted a quality field from as far away as Nelson. 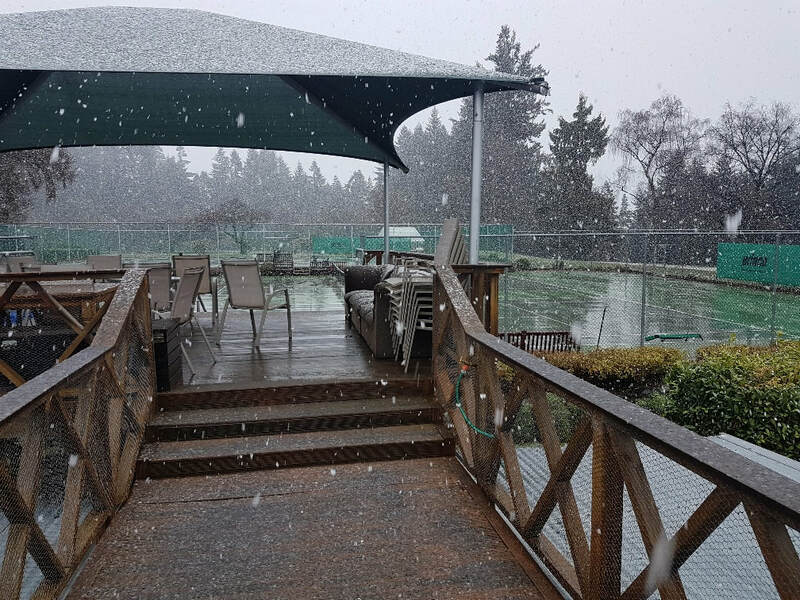 Perfect weather (not too hot, not too cold) enabled the organisers to get through all the main events by the end of Sunday afternoon, culminating in the men's singles finals which was a repeat of the 2016 final between Riki McLachlan and MItchell Sizemore. Once again it went the way of the Queenstowner but he was pushed hard by Mitchell Sizemore. In the ladies' singles Megan Rogers prevailed over Emilia Price, using her power game to overcome her young opponent. In the men's doubles McLachlan teamed up with Peter Hartono to win a closely fought match against Ryan Eggers and Paddy Ou. Emilia Price and Felicity Oxnevad successfully defended their title in the ladies' doubles. Click here for all the weekend's results. Former World #1 doubles player, Liezel Huber visited QTC this week following her participation at the Aussie Open, and had some wise words for QTC's juniors. She said that when playing shots, the following factors should be considered in order of importance. Liezel should know a thing or two. She has 5 Grand Slam women's doubles titles and 2 mixed doubles titles to her name. ​The Parent-Child tournament held of Sunday 20 November was a huge success with 19 teams entered and beautiful weather. Congratulations to Mat & Thomas Begg who took out the overall title and thanks to everyone who participated.